Christine: I have received a short message from the Ascended Master Saint Germain. It was like a short conversation by telepathic communication. He has told me how he will be able to give us financial assistance in the not too distant future, and said that we are in the middle of a final battle against those dark forces which control the world. In a previous message I have indeed been informed that the dark ones’ interference will be removed this summer. I have received symbolic images that carry the meaning that the American Elections and Brexit in Britain are like the top of the iceberg of what is going on, and in one of them this dark force was a Dragon that will be wounded when Britain choses to leave the European Union. It needs to be slain in the sense that we have to overcome it, and perhaps that is what will happen as a great turmoil seems to be created in the process of the American Elections. A great awakening is however resulting from it. A great many people are changing their opinion as so many notions are coming out in the open. Saint Germain conveyed to me the idea that the individuals opposing and fighting the Establishment in the process of the American Elections are having a hard time and are taking a hard beating. Certain Ascended Masters are closely connected with this struggle. So Saint Germain has asked me to make calls for those who are fighting a battle for Freedom and to see if a video with some prayers can be produced. He is the Hierarch of this New Age of Aquarius and of Freedom. He has asked me to make some calls for his Violet Flame as it magnetizes solutions for all problems. 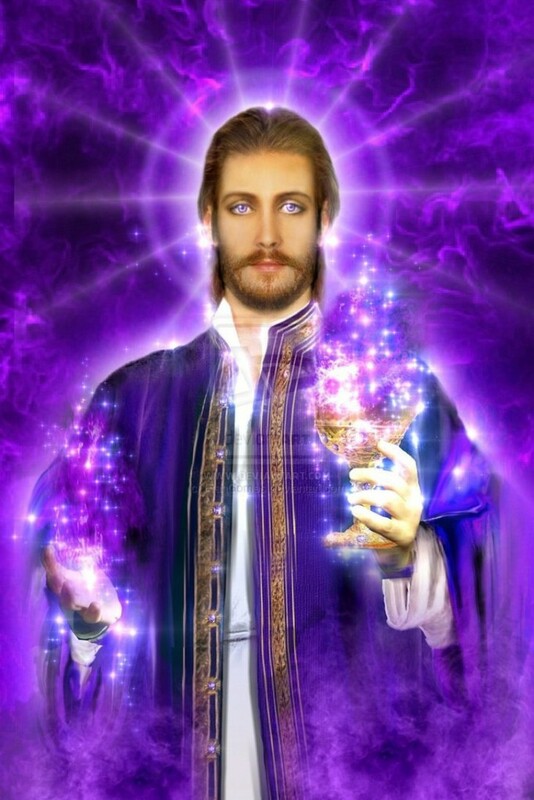 The Violet Flame of Saint Germain is magical and has the power to forever transform all conditions in our material world, as well as manifest the Peace of the Ascended Jesus Christ that Archangel Michael, all Elohim and other Archangels, are assisting us to bring into manifestation. The Call needs to start with an invocation for the Tube of Light and the Solar Ring as a platform for it. Saint Germain said that the warning to the dark forces that Lord Sanat Kumara has channeled through me can be used as a decree just as the Summit Lighthouse’s Judgment decrees which originally were dictations. It needs to be said in the power of the spoken word, or loud, and to be repeated at least three times. Sanat Kumara’s Warning to the Forces of Darkness on the Astral plane was part of the April 24video: Lords Michael and Sanat Kumara, Leap and Woes. The following calls have been formatted in the way requested by Saint Germain, with a preamble, a body, the Judgment Call, and a closing that seals the action of precipitation that causes light from Spirit to descend into matter. Some of the invocations have been modified under the supervision of my Ascended Twin Flame from some decrees in the ‘Prayers, Meditations, and Dynamic Decrees for Personal and World transformation Decree book’ published by the Summit Lighthouse. First we are calling to the God within, and we name some Ascended Masters as well as Archangels. Then we give the command for a particular light action and situation, or a problem needing a solution. One section will be repeated three times for the power of the three times three. And for closing we will be sealing the action of precipitation by saying that we accept, or believe, that the call will be answered. I AM the invincible bride of Christ as I am calling for the Solar Ring. I am standing as a child of God in the earth clothed upon with the Sun of Righteousness. I come with healing in my wings. I have descended from the heart of God from the heart of my own Mighty I AM Presence. I am a soul extension of my very own Higher Self who is descending and taking hold in me. I stand in my own Christ Self, and by the flame within my heart, I do now draw the Solar Ring around my forcefield as the foundation of my life, and around the members of my family and friends, as well as all lightworkers, Star seeds, and all beings in incarnation who have a connection with the Divine Father-Mother of All. I call for my invincible Tube of Light to be established upon the platform of my Solar Ring for the sealing of my identity, my heart and my mind, within this Mighty Tube of Light by the power of the Solar Ring. I draw the solar ring to magnetize the manifestation of God’s Will, heaven upon Earth, as well as the purpose of the Ascended Masters’ activities. I am establishing my Tube of Light for the sealing of the Collective that has to be lifted in its vibration upon a higher level of consciousness and density. This Tube of Light, that now seals us, is a great Pillar of Light from the loving I Am Presence, the light of God above us whose radiance forms a circle of fire before us to light our way. The Mighty I Am Presence keeps this Tube of Light intact through every passing moment, as a shimmering shower of beautiful Light through which nothing of the human effluvia can ever pass, or through which nothing directed from the lower astral can ever pass. Into the electro-magnetic circle of divinely charged energy of this Pillar of Light I am requesting Saint Germain to project a swift upsurge of his Violet Fire of Freedom’s forgiving transmuting flame. The Violet Flame of Saint Germain has the power to change all of our human energies, into the positive polarity of our Great God Self. The magic of this Flame will consume all discord, cause, effect, record and memory of Life, in a flash, and all that was never intended to be. May the Light of the Violet Fire of Freedom’s Love, the Great Cosmic Light and the Light of Cosmic Victory, pour in from cosmic sources, like the power of ten million Niagara Falls, and permeate the atmosphere of earth, its lands and oceans. May it remove all negativities, and together with the Enlightenment of Archangel Uriel, turn this world around in a flash, and bring Saint Germain’s great Golden Age into manifestation, as well as change it for the fulfilment of Archangel Michael’s Ancient Prophecy that will forever lift creation out of the grip of Darkness. Beloved glorious I AM Presence, beloved Father Supreme, I am calling to Alpha and Omega, beloved Sanat Kumara in the Sun with Helios and Vesta, beloved Surya, Lord Gautama, Jesus the Christ, Morya El, Mother Mary, Saint Germain, the Great Divine Director, the mighty Elohim, Archangels, and Chohans of the Rays, the Messengers from the Sun, the cosmic beings of higher dimensions, powers, activities, and legions of Light, the entire Spirit of the Great White Brotherhood, or Brotherhood of the Star, the great hosts of Ascended Masters, the Melchizedek Cosmic Order, and the World Mother, elemental life, fire, air, water and earth. In the name of my loving I Am Presence, the Light of God above me whose radiance forms a circle of fire before me to light my way, I am calling for the restoration of cosmic justice and peace in all nations and especially in connection with the forthcoming American elections. See that the one elected respects the Constitution and spirit of the Magna Charta, as well as every instrument of Freedom, Law and Divine Justice, and is imbued with a spirit of enlightenment. See that nothing interferes with the divine plan and that it is fulfilled with full power. I pray for the protection of the representatives of the people from any attacks of the fallen ones and astral hordes. May the one who will be elected have been tained by the Ascended Masters in the retreats of the Great White Brotherhood. May the opposition through the media be transmuted, encircled, dissolved and consumed with the power of the seven mighty Elohim, and a concentrated release of the sacred fire. I am calling for the binding of all Illuminati interference and their attempt to control the elections. Beloved Mighty I AM Presence, beloved Mighty Astrea, Entire Spirit of the Great White Brotherhood, World Mother, lock your cosmic circles and swords of blue flame of thousands of suns from the Great Central Sun in through and around all opposition to the fulfillment of God’s Will in the process of the nomination and election of a candidate to become the President of the United States of America, as well as any misrepresentation in media coverage, with their causes and cores. Expose the wolves in sheep clothing. Close in upon it all and transmute, transmute, transmute it all, cause, effect, record, and memory – before it can act, approach, or encroach upon life any longer. Replace it all right now by the cosmic threefold flame in the full power of the three times three, in the full power of the ten thousand times ten thousand, and the full power of the thousandfold fame of the sacred love of the sacred fire in overcoming cosmic power, tripled each instant of each hour, until all are wholly ascended in the Light and free. Beloved Archangel Michael, all the Archangels, and legions of Light, Come, come, come in your visible, tangible, supernatural bodies, and strike, strike, strike your mighty cosmic swords of blue flame of thousands of suns from the Great Central Sun, Sun in through and around all opposition to the fulfillment of God’s Will in the process of the nomination and election of a candidate to become the President of the United States of America, as well as any misrepresentation in media coverage, with their causes and cores. Expose the wolves in sheep clothing. Archangel Michael wield your Sword of Blue Flame and now cut all souls free from the shackles of their own creations. Blaze God-power and protection into all of us, to purify our vision for the Awakening. Flash your transcendent Blue Lightning power through all souls to make them more radiant and whole. With your legions of Blue descend to keep us faithful and true. Now by the power of the I AM, we are fully charged and blessed. By your blue flame we are armor-dressed. Beloved Ascended Master Jesus Christ and the seven mighty Elohim, come, come, come in your ascended Master bodies and strike, strike, strike your mighty cosmic swords of blue flame of thousands of suns from the Great Central Sun in through and around all opposition to the fulfillment of God’s Will in the process of the nomination and election of a candidate to become the President of the United States of America, as well as any misrepresentation in media coverage, with their causes and cores. Expose the wolves in sheep clothing. Sanat Kumara: This is Sanat Kumara. I Am that I Am and I now declare through this messenger that you will be no more if you continue in your belligerent ways. I Am that I Am Sanat Kumara, who is stating that from this day on, you will obey, you will not be interferring with the forces of the Light embodied in these, my children, doing my work upon the Earth. From this day on I will prevent interferences from you, forces of darkness that have polluted the Earth and the consciousness of my children of Light born of the Great Central Sun. I will not allow it for they have awakened and turned the world around. They are pure in hearts. They have transmuted karma. By the Law of the One that they are invoking, I declare that this day there will occur an instant wrath to descend upon the head of you, dark ones, if you dare lifting a finger to attack my children of the Light. You will be taken to another world to continue your existence and your evolution now very soon, but if you continue attempting to interfere with them and the affairs of their world, there will be an instant reaction, you will be no more as you will be taken and your life, your very existence, if you can call it a soul, will be thrown in the sacred fires that are on the Planet Saturn, the sacred fires, not to endure eternal hell, because you will be no more, you will lose your very existence. The life of your soul will be taken if you lift a finger against these, my children. You will be no more and you will not pass! I Am Sanat Kumara of the Sun with Helios and Vesta in the Sun of this Solar System. We continue moving in space on our way towards the God Star Sirius where we shall take our place as the 8th system orbiting the Sun systems of this Constellation and we shall take our position planned many millions of years ago. Christine: These solutions in the heart of Sanat Kumara are descending. Christ Consciousness is descending and is awakening the whole world. The Maha Chohan breathes the breath of Life to revive the fire of the heart for freedom to increase. He is blazing forth his breath into all hearts to turn the world around. You will see how this world will turn to the right action, and therefore, the swings of political manipulations will cease. There will be one Law, and one Will in alignment with the Divine Will. Christine: Saint Germain, nothing that I can do on my own can bring heaven on Earth, and the hordes of darkness are causing chaos down below, but I know that with God in me, the key is in the Law of the One. I embody the Spirit of Freedom that will liberate the world from all opposition and conspiracies because I Am in the One and the One is in me, and through that ‘I’ in me, God can change the world but let this be according to His Holy Will. Saint Germain raise us higher with the pulsation of your Violet Flame! You said that the solution lies in the heart of the Word, in the heart of Sanat Kumara, and you did say that the solution to world problems is the Christ consciousness. Let it be awakened in all in whom there is a divine spark! Saint Germain, tear the veil of confusion and chaos and reveal the one living Christ who rules. You once said that the victory of worlds is for the victory not alone of a single planet but of galaxies beyond galaxies. You said that every cosmic victory begins with the single individual. As America, other nations, and the world is being challenged may the promise of the ‘I Am He’ consciousness be manifested in us, so that the dark powers of this world will have to give answer to our declaration of identity in you. Saint Germain is tearing the veil of confusion, of chaos, and is now revealing the Christ who rules in the heart. Out of the Law of the One, he seals us in the heart of the Lord of Righteousness. We are pronounced One forevermore in Spirit, in matter, in body, and in soul. It is a meeting of worlds, not only for the victory of a planet, but the Victory of galaxies beyond galaxies, and its beginning is in the victory of single individuals as a result of their Armageddon in the psyche. And in full faith I consciously accept this manifest, manifest, manifest, right here and now, with full power, eternally sustained, all-powerfully active, ever expanding, and world enfolding until all are wholly ascended in the Light and free! As the call compels the answer, I know that a sacred release of assistance from God’s own heart in the Great Central Sun is being accelerated without limit and that it will be so until all of mankind is ascended and free in the Light that never, never, never fails!